With most of its residents earning no more than 30% of the area’s median income, tenants in Annapolis’s Harbour House Apartments can ill-afford the high utility bills that are a by-product of a leaky, inefﬁcient building. Lowering their energy usage through building science not only signiﬁcantly reduces residents’ energy cost burden, but also makes their homes more comfortable. 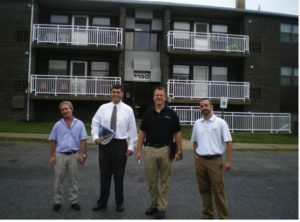 Arundel Community Development Services, Inc. (ACDS), a nonproﬁt corporation dedicated to providing affordable housing and community development services in Maryland’s Anne Arundel County, received an award through MEA’s 2015 Clean Energy Communities Low-to-Moderate Income (LMI) Grant Program to support energy efﬁciency retroﬁts in 142 units at the Harbour House Apartments. As a result of the installed measures at Harbour House, each residence is estimated to save an average of $600 annually. Over their useful life, the installed energy measures will improve the living environments of an estimated 2,576 Marylanders. The goal of MEA’s LMI program is to ﬁnance energy efﬁciency projects that beneﬁt low-to-moderate income Marylanders, particularly by employing innovative strategies that help buildings, neighborhoods or entire communities save energy, save money, and increase comfort. In the case of the Harbour House, an early energy analysis indicated considerable air movement between all three ﬂoors of the units. The units on the middle ﬂoors were leeching energy from the top and bottom ﬂoors. As a result, these units were not meeting a strict 1:1 Savings to Investment Ratio (SIR) or better for planned weatherization and energy efﬁciency measures, a shortfall that disqualiﬁed the project from funding through other programs. The structure of the LMI Program, however, allows for a whole building approach to modeling estimated energy savings that measures all proposed efﬁciency upgrades in aggregate. The program allowed for coverage of additional measures that could not be installed through other programs, including weatherization of all ﬂoors to correct the improper airﬂow of the entire building. Before and After: Adding attic insulation greatly improved both the energy efﬁciency of the apartments and the comfort level of residents. ACDS stretched its grant dollars by taking advantage of economies of scale. As ACDS Construction Specialist Chris Maruyama notes, the typical $7,000 cost for the installation of a 92% AFUE furnace and 15 SEER air conditioning systems dropped to $4,650 when the units were purchased and installed in bulk. As a result of this savings, ACDS was able to upgrade additional residences. Leveraging additional funds and resources also helped ACDS maximize the energy savings it could achieve at Harbour House. Rebates from the BGE Smart Energy Savers Programs helped support the purchase of AC equipment and EER TAR qualiﬁed refrigerators. Through the LMI program, contractors are authorized to apply directly for the rebates, thus enabling them to reduce their prices accordingly. As the leveraged funds lowered the overall cost burden for installed items, ACDS was able to weatherize additional units. Thanks to these combined strategies, the $600 per residence annual savings from the weatherization and energy efﬁciency measures installed at Harbour House will help residents stretch their limited budgets to cover more of life’s essentials.